ca. 330 - 310 B.C. Detail of the Judges of the Dead from a painting depicting Heracles' journey to the underworld. Rhadamanthys, on the right, wears a Phrygian cap and robe, and holds a royal sceptre. 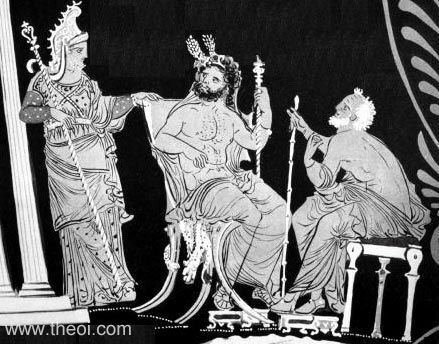 Minos enthroned in the centre holds a royal sceptre and is crowned with a wreath (of asphodel?). The elderly Aeacus is seated on a stool to the left, and holds a staff.